Twitter is a microblogging platform increasingly used in medicine to overcome geographic barriers and promote international connections. Tweets, the 280-character microblogs, are catalogued by hashtags (#). 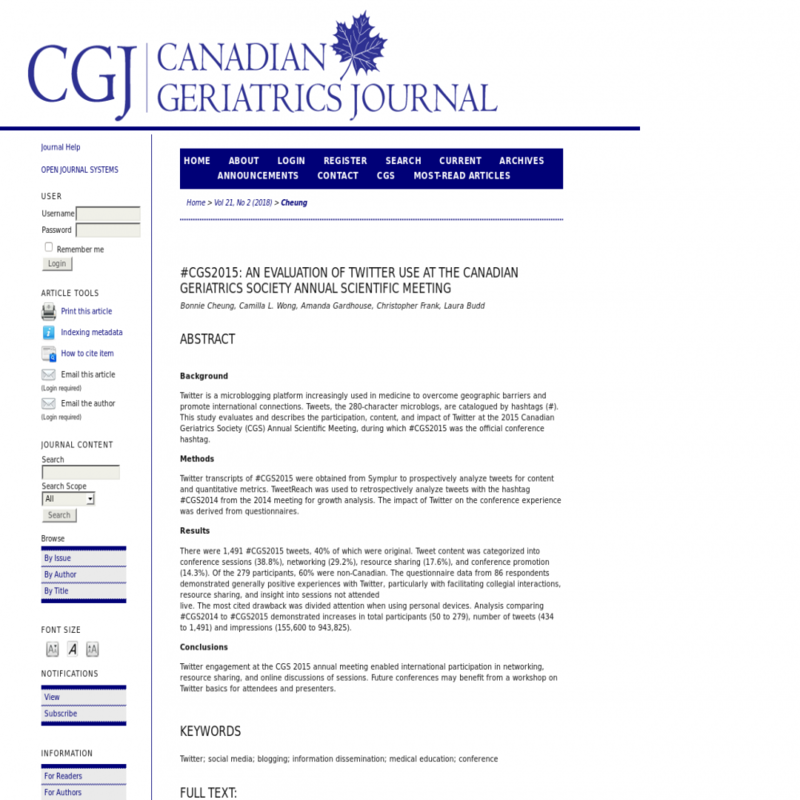 This study evaluates and describes the participation, content, and impact of Twitter at the 2015 Canadian Geriatrics Society (CGS) Annual Scientific Meeting, during which #CGS2015 was the official conference hashtag. Twitter transcripts of #CGS2015 were obtained from Symplur to prospectively analyze tweets for content and quantitative metrics. TweetReach was used to retrospectively analyze tweets with the hashtag #CGS2014 from the 2014 meeting for growth analysis. The impact of Twitter on the conference experience was derived from questionnaires. There were 1,491 #CGS2015 tweets, 40% of which were original. Tweet content was categorized into conference sessions (38.8%), networking (29.2%), resource sharing (17.6%), and conference promotion (14.3%). Of the 279 participants, 60% were non-Canadian. The questionnaire data from 86 respondents demonstrated generally positive experiences with Twitter, particularly with facilitating collegial interactions, resource sharing, and insight into sessions not attended live. The most cited drawback was divided attention when using personal devices. Analysis comparing #CGS2014 to #CGS2015 demonstrated increases in total participants (50 to 279), number of tweets (434 to 1,491) and impressions (155,600 to 943,825). Twitter engagement at the CGS 2015 annual meeting enabled international participation in networking, resource sharing, and online discussions of sessions. Future conferences may benefit from a workshop on Twitter basics for attendees and presenters.